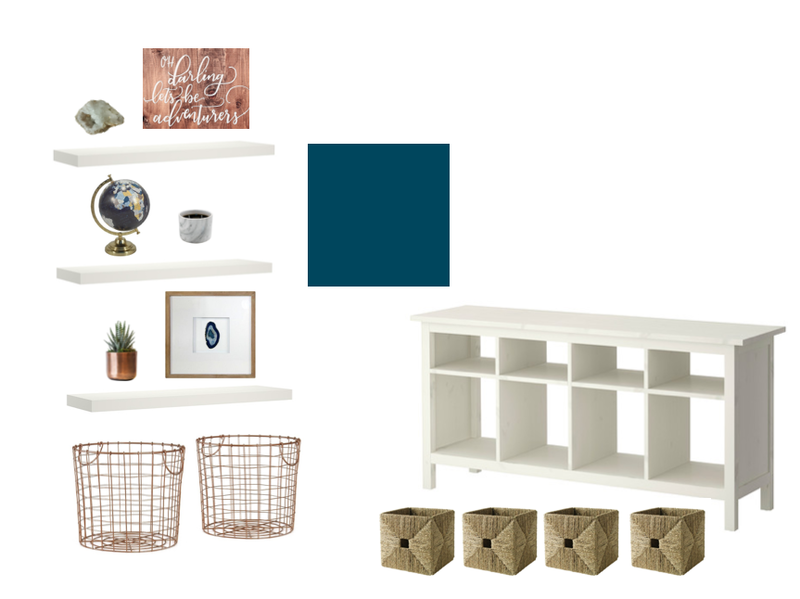 For today's Makeover Monday post I am showing you the last concept design for our family room. This is for the corner located to the right of the sliding glass door from the last design post. On the left is the wall to the right of the sliding glass door. You know that I love open shelving. I thought this space was the perfect place to add some more. I have three white shelves all including decorations that tie in with the colors of the room. Underneath the shelves we have two wire baskets. We currently have two orange wire baskets here where we store Scout's toys. I love that the baskets store his toys in a stylish way and that he always knows where to go when he is ready to play. The console table to the right is located on a new wall. The wall to the right of the open shelves. The table is located underneath the cutout in the kitchen that overlooks the family room below. It is the perfect size to fill this space and add some much needed extra storage space. The storage boxes fit into the bottom spaces of the console and are great for holding our massive movie collection but hiding the clutter that goes with it. The smaller spaces above add more storage for our everyday knick knacks and I am hoping to find a stylish way of displaying some board games there as well. I love the overall feel of this corner. It adds the perfect amount of warmth in our otherwise cool home.